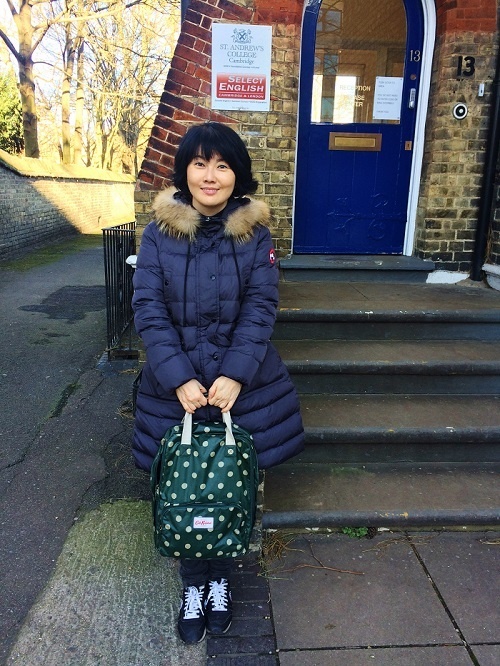 Meet Soungmi, one of our students from Korea. Soungmi is 45 years old and is studying on our 15 hours General English Course. She lives in Cambridge with her son, who is also a student in Cambridge. I’m studying English so that I can improve my skills and take care of my son while he is here in the UK. What do you enjoy about Select English? I like my teachers Andy and Nadine because they are cool! I like it because it is quieter than London and it is very peaceful. I like the countryside and the beautiful views. Have you been on any trips in the UK? I have visited Bury St Edmunds, London and Oxford, but Cambridge is the best! Would you recommend Select English to your friends? Yes, because the teachers are friendly and it’s a nice place to be a student.